The partnership is now well underway, with both UQ academics and students are closely collaborating with Port of Brisbane (PBPL) staff in all research areas. Keep up with the partnership and our projects with our updates below. An innovative research partnership between The University of Queensland and the Port of Brisbane has been honoured with a 2017 UQ Partners in Research Excellence Award (PIREA). The PIREA is one of three categories at UQ’s annual Research Week Awards. 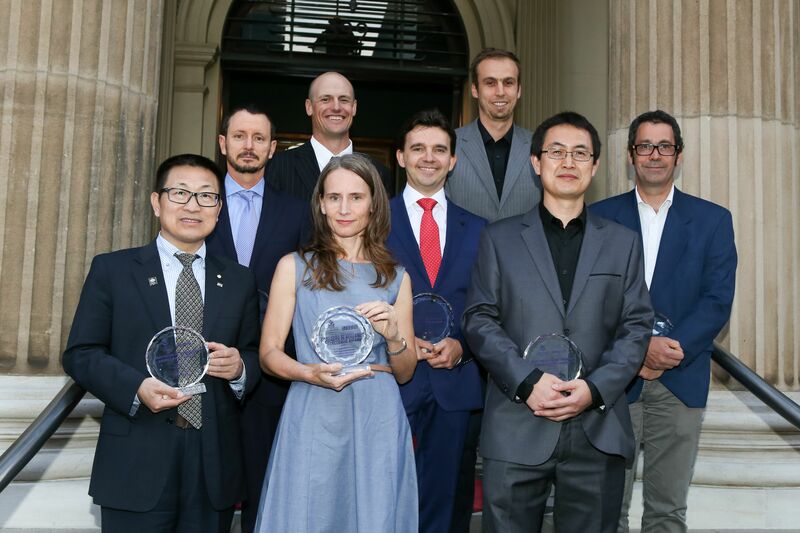 The award highlights outstanding industry-UQ collaborations that have benefited industry and the community. Established in early 2015, the Developing Port Growth partnership connects researchers from UQ’s Faculties of Engineering, Architecture and Information Technology and Business, Economics and Law with Queensland’s premier multi-cargo port. Led by Professor Carlo Prato and Dr Alistair Grinham from the School of Civil Engineering and Dr Peggy Schrobback from the School of Economics, the partnership has dual aims: to future-proof Port growth in an increasingly competitive global trade environment, and to stimulate the Queensland economy. Beecroft, R., Perez, L., Grinham, A., Visscher, J., Hildebrandt, A. and Cossu, R. (2017). Sediment concentration profiles and transport dynamics near the Port of Brisbane, Moreton Bay, Queensland. In: Coasts & Ports 2017 Conference. Australasian Coasts & Ports Conference, Cairns, Australia. 21-23 June 2017. The 10th International Conference on City Logistics 2017: Elnaz Irannezhad, Carlo Prato & Mark Hickman “The Choice of Using Distribution Centres in the Container Import Chain: A Hybrid Model Correcting for Missing Information”. Phuket, Thailand, 14th-16th June 2017. Published in Proceeding of the 10th Conference on City Logistics, Wiley-ISTE. The Developing Port Growth partnership was selected as one of 6 global case studies selected for presentation at the AGM and Presidents Conference. Universitas 21 AGM and Presidents Conference 2017: Vice Chancellor Peter Høj “Developing Port Growth – The University of Queensland and Port of Brisbane Pty Ltd. Research Partnership” Nottingham, UK. Three undergraduates students (Nicholas (Nick) Hutley, Nathaniel Deering and James Lockington) presented at the international conference ASLO 2017 Aquatic Sciences Meeting in Honolulu, Hawaii (26 Feb – 3 Mar 2017). PBPL Partnership update: first mud sample collected. Undergrad researcher James Lockington and international intern Larissa Perez examine mud to better understand how floods impact Moreton Bay.